At trade shows, when I speak with audio professionals from equipment rental houses and production companies, as well as DJs and musicians, they are often surprised by the diversity of the American Audio speaker range. 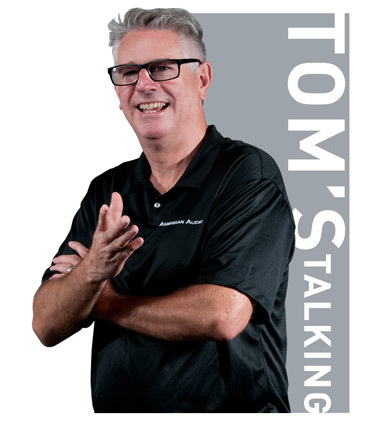 So, I thought that I’d dedicate this month’s ‘Tom’s Talking’ to breaking down our product line-up to show how American Audio has your speaker needs covered, no matter the application. Without doubt, American Audio is best known as a reliable and affordable brand offering portable speaker systems for live events, gigging musicians and mobile entertainers. Our CPX Series – available in 8”, 10”, 12” and 15” models – offers professional-caliber active speakers featuring powerful class D amplification and flexible connectivity. With a durable construction, including heavy-duty steel front grills and ergonomic handles, the CPX Series speakers have been appropriately named ‘road warriors’ as they are perfect for use by mobile performers and event production companies. While each of the models in the CPX Series offer full and detailed sound reproduction, there will be situations – such as live rock performances and EDM events – when increased low frequency power will be required. American Audio has this covered in the shape of the PXW 18P portable active subwoofer. Based around an 18” speaker cone, the PXW 18P provides extreme low frequency power while minimizing vibration and is fitted with heavy duty castors to help with transportation. Here at ADJ we also appreciate that in some cases budgets can be tight, which means even more affordable speakers are required. Our new ATX-15W offers a slightly lower price point than the CPX 15A, but still offers plenty of good quality sound as well as the added advantage of wireless audio connectivity. Not only does this mean that music can be transmitted to the unit cable-free from a phone, tablet or PC, but also that two speakers can be paired so that the audio input to one is sent wirelessly to the other. For when budgets are extremely low we also have the ELS15A, ELS-15BT and LTX15BT, which are suitable for small or mid-sized events and are also ideal for use as backup speakers. The BT models not only feature wireless audio connectivity but also in-built MP3 players, with USB and Memory Card slots, as well as XLR mic inputs. This makes them perfect for ‘background’ music during cocktail hours, or for speeches at weddings, as well as for house parties and other informal gatherings. While traditional loudspeakers such as those found in the CPX, ELS and LTX ranges are still extremely popular, there is a new trend – especially among mobile entertainers and performers – towards using portable array systems. American Audio’s new STK106W is a powerful and versatile 2-way portable system that combines a 10-inch woofer with an adjustable pole-mounted 6 x 2-inch driver satellite array to produce a dynamic sound across both high and low frequencies. Featuring an in-built 6-channel mixer and wireless audio connectivity/linking, this impressive system is ideal for all portable event applications but especially solo and duo performers. But what about those situations when a sound system is needed but a power supply isn’t available, for example an outdoor event or performance? Well, you guessed it, American Audio has you covered. The ELS GO series is a collection of active speakers that feature in-built rechargeable batteries meaning that amplified speech and music playback is now easily possible absolutely anywhere. Including both compact 8” models and a powerful 15” version, the ELS GO range gives new creative freedom to entertainers and performers as well as audio technicians. As you can see, the American Audio range has lots of options for every situation where portable audio may be required, but what about permanent sound system installations? Most of the speakers in the range can be installed as part of a fixed system, and the CPX Series is particularly well-suited, but American Audio also has a range specifically developed for that purpose: the Sense Series. Featuring 8”, 12” and 15” full-range speakers, as well as 15” and 18” subs, this sleek range of passive enclosures offer four pole twist-lock connectors, heavy-duty powder-coated steel grills, acoustic foam lining and integrated M8 rigging points making them ideal for installation in bars, lounges, clubs, concert venues and houses of worship. So, whatever your requirements and budget, there’s a product in the American Audio range that will fit the bill. And, when you choose American Audio, you can be assured that you’ll be getting the absolute most bang for your buck, as throughout the range we’ve chosen the best possible components and engineering at a given price point. Put simply, if you need new speakers, American Audio really does have you covered!